We finally got an entire weekend with a good weather forecast, so off we went to the mountains. A weekend of climbing was the obvious thing for both of us. 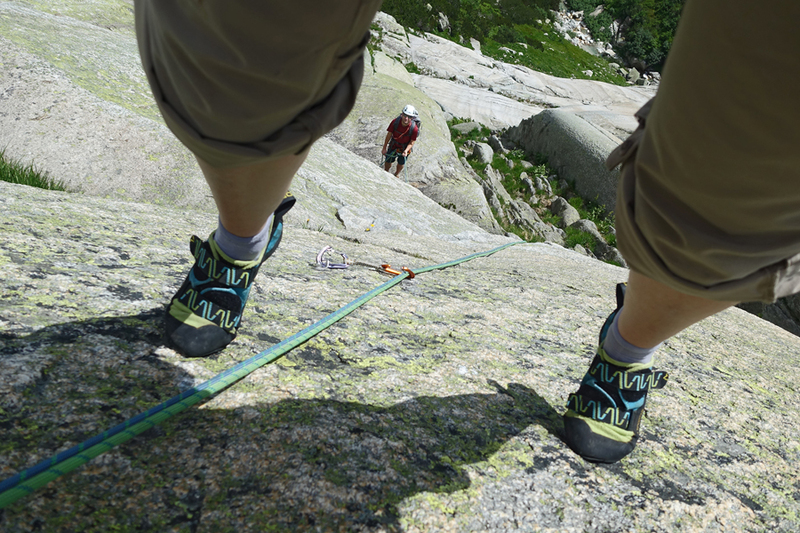 We wanted to do multi-pitch and Greg was really strongly in favor of granite, ideally slabs. 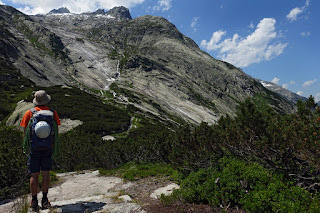 So off we went to the Grimsel. After a fairly early start on Saturday and the usual train-train-train-bus action we got off the bus at the Chutzelentannen stop under the Rätterichsbodensee. After a short (~15 minute) walk we were at the foot of the route Bazi und Bizi. Andrea managed to convince the two Dutch (?) who arrived just before us to climb another route, so we put on the gear and started climbing. This is a pretty easy, super fun climb. A large part of it was slab climbing, with little in the way of obvious handgrips, but very grippy rock. There were a couple of "yeah, this is 5a" bits in some of the 5a pitches, but it is more or less 10 pitches (Andrea combined two into one) of fun in about 2.5 hours (the climbing isn't that tough and we don't screw up the rope logistics badly at any point, so we were pretty quick). We don't want to abseil, and finding our way over to the foot path down is a bit of an adventure - tramping through and over the shrubbery - but eventually we make it down to the bottom. Onward we go, past the path to the Bächlitalhütte and then along the side of the Rätterichsbodensee. This path is officially still closed due to snow, but the one patch still blocking the path isn't hard to get around. The various climbing routes here (the Seeplatten) are still quite well occupied. Onward we go, around the end of the lake, and then up, up. 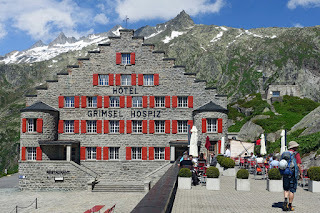 to the Grimsel Hospiz, where we're staying the night. We start with a cool drink on the terrace (with a fantastic view) and then check into our (very nice) room that shares the same view. An aside: if we get to the point that we can comfortably climb 6b's, the sector Maree, right next to the Hospiz, looks interesting. After showers and a bit of rest we enjoy a great meal and then head off to bed. We're underway again by 8:30 the next morning (after a good breakfast, again with great views). We head back to the Rätterichsbodensee. The first couple of groups have already started, including a group on Tim and Struppi, which was the route we'd thought about doing. Greg is already kind of in the mood to do more practice rather than a long route, so we opt to move on to the Azalee Beach sector (which has shorter routes) instead of waiting. We'd seen this lovely slab the previous afternoon and thought it looked great, if somewhat crowded (it's the closest set of routes to the parking lot below). We're happy to be the first ones there, so we can scout around and pick the route that looks best. This starts with lovely 5a and 5b pitches and then moves onto a 5c. Greg's lead climbing this and manages to get up onto the step that (he thinks) is likely the reason for the rating without too much trouble (a couple of decent grips allow this). Unfortunately this is followed by a traverse just above the step of a section of 5b slab without anything there for the hands (we realize later that the name of the route is "Traverse stupid"... that makes sense). After thinking about it for a bit and looking for other options, Greg decides to head back down a bit and cross over to the next route, which is not too far away. This goes pretty quick after he falls while climbing down from the step. The next route over, Härdöpfel, pretty soon thereafter hits its 5c bit: a short steeper stretch without anything for the hands. After trying for a bit, Greg wimps out and heads back down. Andrea heads up and, after managing to place the carabiner at the top (using a sling), makes it through the stretch. Greg, now rested, follows. The last pitch includes a fun stretch of crack climbing and then we're at the end. 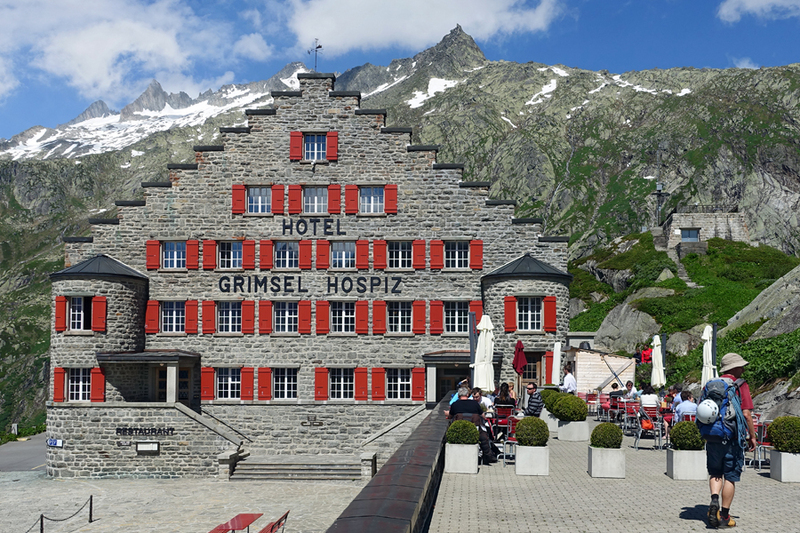 After abseiling down we take a short break and then head over to Grimsel Life (I think). Here we do the first two pitches before abseiling down. Noteworthy on the trip back. Instead of taking a seat in Interlaken, we grab a table in the restaurant car and enjoy a pretty good meal away from the hectic of the sunny Sunday train. When this works, it's definitely a good way to make the trip back from the mountains more enjoyable. Overall a very nice weekend of climbing; we both really enjoy climbing granite slabs. We've made a ton of progress over the last year: 5a on slabs is now no problem, 5b is challenging, and 5c is at the edge. The area wasn't nearly as full as we might have expected given the good weather and the renown of the region.